Congratulations, soon you can invest in the fastest growing part of the economy! Until now, 99 out of 100 Swedes have missed the opportunity to invest in promising growth companies that are not on the stock exchange. To become a partner in these has so far been reserved for professional investors. Or a few private individuals with large contact networks. We think that's wrong. That's why we founded Pepins. • Opportunity to regularly buy and sell shares in over 30 exciting companies in our marketplace. Becoming a member of Pepins is free and only takes a minute! Welcome to Sweden's busiest marketplace for crowdfunding and trading in unlisted shares! As a member of Pepins, you get access to the fastest growing part of the economy growth company that has not yet reached the stock market. The group of companies that have historically provided the best return over time *. By investing from SEK 500 in any of our crowdfunded issues, you can become a partner in companies you like, you can influence which companies receive growth power. It is precisely in this phase that many companies need capital in order to continue to grow. In this way, you are involved in supporting the entrepreneurs and business ideas that can become tomorrow's big company. Together, we contribute to innovation, growth and more jobs. Unlisted growth companies account for the largest potential economic development in Sweden. Yet that investment opportunity has only been available to a very small group of investors. Until now. Through the Pepins model, everyone now has the chance to become a partner in companies they like and believe in. And to see businesses grow and participate and influence. Since Pepins was launched in March 2016, our just over 45,000 members have contributed more than SEK 820 million in growth capital. We call it part ownership! At Pepins you can become a partner in two ways. Either you can buy shares under any of our crowdfunded issue campaigns. The companies then take in new partners by the owners selling some of their shares. Or you can become a partner by buying shares on our trading site. The issue campaigns are limited to a certain number of shares that are sold at a fixed price. When these are sold out, the issue is fully subscribed. 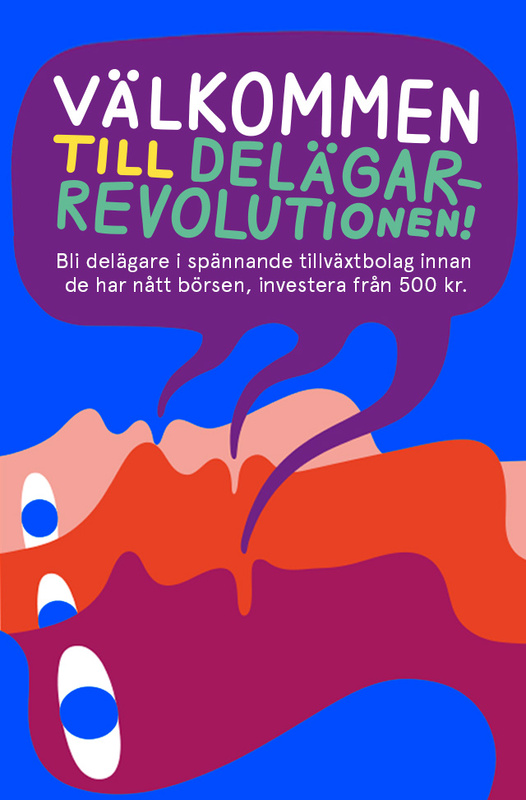 It doesn't matter if you want to buy shares for SEK 500 or SEK 500,000, it is the first come first served. At the trading site you can then regularly buy (or sell) shares between once a quarter to once a month. The shares are classified as unlisted, because we do not have daily trading and are subject to a different regulatory framework than the one that controls the stock market. The share price is governed by supply and demand and is determined after sellers and buyers have placed their respective bids, something that happens completely digitally. The first trading opportunity usually occurs about one year after an issue. It is as easy to buy shares with us as it is to trade most things online, for example it is good to pay with Swish. Pepins was the first in the world to trade in crowdfunded shares. It is at the beginning of a business trip that the really great values are created, at the same time it is associated with high risk of investing in this type of early company. Because even though all companies that are placed on Pepins have undergone a solid precursor process, there are no guarantees that everyone will succeed on their growth journey. Therefore, we usually recommend spreading their risk by building a portfolio and becoming a partner in at least 10, preferably 20 companies **. One should also be long-term and have at least five years as an investment horizon. In order to invest in our issue campaigns, you need to be a member of Pepins. It is free and you do not commit to anything. As a member, you will receive pre-information about our future companies and campaigns. At Pepins new companies and investment opportunities are constantly emerging. But since it has happened that emissions have been fully subscribed in less than an hour, so it can be a good idea to become a member today if you want to be sure not to miss any exciting opportunity. Pepins is under the supervision of the Swedish Financial Supervisory Authority and is licensed as a securities company. As a crowdfunding company, we are alone in Sweden. * The Pepins model with a combination of crowdfunding and stock trading is new and unique. There are studies on business angel investments, which show that investments in companies in the early stages generated over 20% in average annual returns. Entrepreneur-driven companies have historically generated the best return over time. Nowadays, companies are also later moving to the stock exchange, which means that a large part of the growth and thus also the value development takes place before the companies are listed. ** In a survey by Nordic Business Angel Network (* NordicBan), a business angel who invests in growth companies should become a partner in at least 5-10 companies with a maximum of 10-20% of their investment capital. The time, knowledge and capital required to negotiate professional terms have meant that investing large amounts in the past has only made sense. To carry out 10 investments of 500,000, SEK 5 million is needed, ie SEK 50 million if it is to correspond to 10% of invested capital. In Sweden, 38,772 persons have assets of more than USD 5 million (Credit Suisse 2014), which corresponds to 0.39% of Sweden's population. Nesta Publications – rapporten Siding with the Angels. Business angel investing – promising outcomes and effective strategies. Become a member at Pepins, it's free of charge and only takes a minute! Sweden's busiest marketplace for crowdfunding and trading in unlisted shares! Beijing8 har idag tio restauranger och finns i 140 butiker. Egen produktion och bevisad lönsamhet i båda affärssegmenten. Stora expansionsmöjligheter med existerande affärsmodell för att bygga det ledande varumärket för dumplings i Europa. Satsar mot SHL - behöver din hjälp på resan.